The lungs are the center of the respiratory system, which includes the nose, throat and trachea (windpipe). 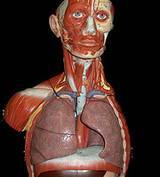 Air comes into the body through the nose and mouth and travels through the larynx (voice box), to the trachea, which branches into two main tubes or bronchi. From there air moves into the inner recesses of the lungs, where the lungs transfer oxygen into the blood via small air sac's called alveoli. Each alveoli has extremely thin walls containing a network of capillaries involved in the exchange of oxygen and carbon dioxide. Breathing, usually automatic and regulated in the medulla oblongata of the brain, takes place 10-15 times per minute, inhaling occurs when a message is sent from the respiratory center of the brain to the diaphragm and certain rib muscles. These contract, pulling the lower surfaces of the lungs downward so they can fill with air. Stretch receptors in the lungs the send signals back to the brain, which causes the diaphragm and rib muscles to relax. This in turn causes the diaphragm to move upward, so that the air is exhaled. It happens this way; the right side of the heart pumps blood with a high concentration of carbon dioxide into the lungs. There the carbon dioxide is replaced with oxygen, which caused the blood to change from a dark red to a bright red color. This indicates that hemoglobin has picked up the oxygen. The oxygen-enriched blood is then pumped through the left side of the heart, ad ext circulated throughout the body. Then the carbon dioxide is exhaled. The respiratory system is sensitive to the amount of carbon dioxide present in the blood. If this amount rises, the breathing response will increase so that more oxygen so that more oxygen is available for energy metabolism. Most people start out with a pair of bright pink lungs. As they go through life many individuals either knowingly or unknowingly abuse, weaken and cause lungs disease. The seriousness of this cannot be overemphasized. Remember, the respiratory system is responsible for supplying oxygen to the blood and expelling waste gases. Without life giving oxygen, cells cannot utilize the energy resources that are available to them and so cannot function. If the efficiency of the respiratory system begins to diminish, any energy stored in the body has to be released at a slower rate. Cigarette smoking is one of the major causes of lung disease. The two most dangerous substances found in cigarette smoke are nicotine and carbon monoxide. Nicotine believed to be responsible for the addictive properties of cigarettes, causes the release of epinephrine, a hormone secreted by the body. This in turn produces an increase in blood pressure and heart rate. Carbon Monoxide prevents the blood from carrying the full amount of oxygen, and over time this can be extremely harmful. The respiratory tract is especially vulnerable to particles floating in the air due to pollution. It is estimated that as much as 20 trillion particles of foreign matter per day! The respiratory system has several ways of dealing with these particles. For example, the cough and the sneeze keep the passageways of the lungs clear of foreign matter. Cilia, the hairs in the nose, trap irritants, contaminants, bacteria, viruses, fungi, vehicle exhaust, and other materials the body considers foreign. But not all particles are trapped here. There are also cells in the respiratory tract especially designed to engulf and rid the body of foreign particles. These particles irritate the tissues, causing them to swell and produce extra mucus. The swelling and mucus eventually obstruct the passage. If particles are trapped further down the tract, bronchitis and asthma may result. Since oxygen is vital to the energy needs of the body, it is essential that we maintain healthy lungs by breathing unpolluted air as much as possible and by in general supplying the body with good nutrition. Mullein is a very versatile herb. It was used in North America by the early Indians for many infections especially for respiratory problems and lung infections because fo the dusty conditions of the terrain in which they lived. Combined with prickly ash the Indians found the mixture helpful for bronchial infections. These herbs among others in combination as medicinal tea, poultices and herbal capsules are excellent sources to expel mucus and restore oxygen levels.